Welcome to our website! You will find information about our organization, our activities and therapy dogs in general. Puppy Love Therapy Dogs, Inc. is a 501(c)(3) IRS nonprofit/charitable organization. 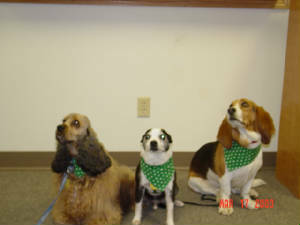 Puppy Love Therapy Dogs, Inc. is based in south central Minnesota, the Mankato and New Ulm area. We are a group of volunteers who take their dogs to various nursing homes, assisted living facilities, hospitals, schools or any place where a visit from our dogs would brighten someone's day. All Puppy Love Therapy Dogs visits are offered free of charge as a community service. The visits last about 30-60 minutes and usually take place in a community room. We typically take several dogs to a visit, but we also have an individual "Hug a Pet" program that is focused on children in need of a friend. We are a tax deductible corporation under 501(c)(3), making all donations tax deductible. All the dogs in our group have been trained and tested in accordance with Therapy Dogs International or Therapy Dogs Incorporated (nationally known therapy dog organizations.) Our dogs must be well behaved, well groomed, social with both people and other dogs, and must be comfortable in numerous situations. Click here for information about Therapy Dogs Inc. Happy St Patrick's Day from the Irish dogs! Unlike service dogs, such as seeing-eye dogs, our dogs provide emotional support to the elderly, their families and hospital patients. We have developed different programs from informative to entertaining. Topics include dog care and grooming, dog safety, reponsibility for pets and prevention of cruelty to animals. We don't want to forget, one of the most important parts of any visit.....simply "petting the dogs". Any time we can bring a smile to a face that needs it...makes our day! Our group has dogs of various pedigrees. Our mix of dogs include: hounds, retreivers, cocker spaniels and various mixed breeds (something for everyone). On average, we make several visits a month in the Mankato and surrounding area. Sometime in the future we will have a great photo to put here.